The end of this year will mark 10 years since my world changed, 10 years since my parents scoured the internet trying to find anything about this new syndrome, 10 years since I was diagnosed with Loeys-Dietz syndrome. 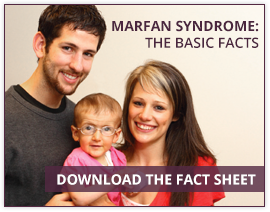 My parents found some of the information they were looking for on The Marfan Foundation’s website. Then, the following summer, they took my brother and me to a conference the Foundation was having in Philadelphia. I was in the kids program with my brother and we basically stuck near each other, not really knowing what was going on. We made a few friends and thought nothing of the matching t-shirts we had to wear for a day. One of my brother’s friends got to throw out the first pitch at the Phillies game that we attended with other members of the Foundation. My brother and I treated it like a slightly skewed vacation where we didn’t really see our parents throughout the weekend. Little did any of us know that this would just be the start of something truly amazing. Since then, my family and I have been to six more conferences and made numerous friends from all over the planet. After a few years, and seeing more doctors then I could count, I came to the understanding of what Loeys-Dietz is and how it affects me. Conference has taught me about the difference between my condition and the conditions of my friends. Conference makes me feel not alone because it has given me friends who are going through things similar to me. They are friendships unlike any other because we all share a bond that can’t be broken with gossip and rumors. It’s a bond that is a part of who we are, it’s what makes us who we are. The friendships I have made at the conferences are some of the greatest friendships I have. They are friends who I trust and can rely on if I need someone to talk to. Conference has made me the person I am today. Next year in 2016, I will be celebrating the tenth anniversary of the event that forever changed my life, the conference that would be the start of a new chapter in my life, whether I knew it or not, the conference that would be the start of something truly amazing. Every day I am thankful for conference. Every year I get to spend a weekend with some of the greatest (and, in most cases, the tallest) people anywhere. To me, conference means more than just listening to professionals talk about various things. To me, conference is life-long friendships with some the best people in world who understand what it’s like to have a genetic condition and who know how to be there for someone even when they are hundreds of miles away. The Annual Family Conference is the reason why I Fight for Victory. Peter Donato, from Framingham, MA, is a junior at Emmanuel College in Boston.